This year brought a number of interesting changes to the District. As noted in the Executive Director’s column, our information services and flood warning (IS/FW) activities were elevated to full program status and we doubled our full-time staff to a grand total of two with the addition of Chad Kudym. Derrick Schauer helps us out as our part-time IT consultant and Stephanie LaCrue assists us in-between her studies at the Colorado School of Mines and helping Mark Hunter with the District’s Maintenance Program. What a team! IS/FW activities are not new for the District, but both are heavily driven by information technology. Consequently, our system support requirements have steadily increased and the need to adapt to new technologies never ends. One of our main program objectives is to keep pace with our local governments, consultants and other partners while striving to meet the demands of a modern office and an electronically informed public. Another growing need is to provide our Floodplain Management Program with GIS and IT support for FEMA map revisions and DFIRM conversions (see Bill DeGroot’s column). Other District programs also utilize GIS and require periodic staff training and assistance. Over the past two decades we have accumulated a sizable archive of electronic information. Better strategies, procedures and facilities are needed to effectively manage and protect these resources. IT infrastructure improvements will be in place early next year to help us meet this challenge. The IS/FW program is also responsible for documenting floods that impact the District. This activity turned out to be one of our lesser chores this past year. In fact, the 2005 flood season may be considered one of the District’s least active in its 36-year history. In spite of this reprieve, the interest in local flood response and recovery has never been higher. It is so high that I was tempted to devote the remainder of this column to the headline: In the Aftermath of Katrina. The gulf coast hurricane disasters continue to be a hot topic for headline news and magazines across the Country. The catastrophic flood losses and death toll have caused many communities to ask the question—could this happen here? Dave Lloyd answered this very well in his column and yes, we are very fortunate to live in Colorado, but we should never forget our flood history as current events remind us of how vulnerable we really are. As our nation deals with the recent gulf coast catastrophe, the elevated fear factor has caused District communities to reevaluate their current capabilities, identify weaknesses and take prudent steps to become more disaster-resilient. The City of Boulder and University of Colorado at Boulder are currently developing comprehensive disaster mitigation assistance plans. Once completed, FEMA will regard Boulder and CU as a disaster resistant community/university. This designation will qualify them for federal mitigation funding to further reduce their risks. These plans are intended to address all hazards, but the flood risk is considered their primary threat. Denver is also focusing on improving flood response capabilities by undertaking a detailed review and update of their standard operating procedures. Efforts are also underway to prepare a comprehensive flood recovery assistance plan. AMEC is providing consulting services for Denver and the Boulder/CU projects. The District is participating in these activities. The flood safety information website http://floodsafety.com/colorado project was started in 2003 as a cooperative effort between the District and the City of Boulder. The project was later expanded to address Jefferson County flood hazards and very soon, the second phase for Boulder will be underway. Project funding to date has been provided by the District, Boulder, Jefferson County, the Colorado Water Conservation Board, University of Colorado, U.S. Geological Survey, FEMA through the Colorado Office of Emergency Management, and the Public Entity Risk Institute. The multimedia website features flood videos, testimonials, descriptions of past floods, aerial photographs, flood inundation maps and a media kit for use by local newspapers and TV stations. More community involvement is planned for Boulder’s second phase as well as a feature length video production for possible PBS broadcast. Is my property in or near a floodplain? This frequently asked question has motivated the District to develop more effective ways to help people find the answer. With the Internet being the vehicle of choice, we wanted to keep the procedure as open as possible, minimize our system support requirements, avoid costly software acquisitions, and leverage available Internet resources. Bruce Rindahl with Leonard Rice Engineers (LRE) developed a procedure for the District that utilizes an open source Internet program language known as Scalable Vector Graphics (SVG). The address locator is powered by Google. The USGS and Microsoft’s Terraserver are the source for background images. GIS shape files are used to render transparent floodplain overlays, roads, hydrography, county boundaries and the District boundary. LRE is hosting the website. An SVG demonstration webpage link can be found on the District’s homepage www.udfcd.org. The District has been a CoCoRaHS sponsor since 2002. CoCoRaHS stands for Community Collaborative Rain, Hail and Snow Network. It was started by the Colorado Climate Center at Colorado State University following the 1997 Fort Collins flood. Nolan Doesken heads this nationally recognized project that includes cooperative observers from neighboring states. Anyone interested in becoming a CoCoRaHS observer or learning more about this program should visit their newly improved website www.cocorahs.org. LRE used SVG to develop an improved CoCoRaHS/ALERT combined data display for the District. The interface is identical to the floodplain mapping procedure described previously and can be run from the same website. Real-time data is accessed directly from XML files generated by the two source websites. Rainfall for the previous day is then rendered for the browser. The application also includes an historic data retrieval feature. A free plugin from Adobe is required for Internet Explorer users. The latest version of Mozilla Firefox does not require a plugin. Five new stations experienced their first full year of operation in 2005: Aurora FS-12, Flying J, Murphy Creek, Shop Creek and Iliff Pond. The first 3 stations are located in the Upper Sand Creek basin in Aurora. The Shop Creek rain gage is a relocated site near Quincy Ave. and Parker Road in Aurora. The previous Shop Creek station was installed in 1990. The Iliff Pond station is located on Goldsmith Gulch in Denver. The newest station to come on line is the Stapleton weather station, which was formerly located at the Urban Farm and discontinued in 2003. The new site is just east of the old site near Havana and Smith Road. By spring of 2006, we are anticipating four additional stations: two on Boulder Creek in the City of Boulder, one on Lakewood Gulch in Denver and another near the Colfax Ave. crossing of Sand Creek in Aurora. New system expansion projects are anticipated for Aurora, Parker and Douglas County, and the District is investigating the possibility of installing an ALERT rain gage at NCAR’s precipitation measurement test site located south of Boulder near Marshall. OneRain of Longmont provided the 2005 ALERT maintenance services for the 14th consecutive year. Our Internet website has been improved substantially this year. Be sure to read Chad Kudym’s article to learn the details. The District’s 27-year-old flash flood prediction program (a.k.a. F2P2) provides daily forecasts and flood threat notifications to District local governments from April 15 through September 15. HDR Engineering of Denver provided the operational support for 2005. John Henz was HDR’s project manager and lead meteorologist. This was the fifth consecutive year for HDR as the District’s meteorological services provider. The 2005 flood season was the fourth consecutive year deemed below average with regard to the number of observed threat days, 22 compared to an average annual number of 28. No messages were needed during the months of April, May and September, which is quite unusual. June 2-3 kicked-off the flood season with flash flood warnings being issued for both days. Following this two-day threat period, subsequent storms produced only minor nuisance flooding with the threat remaining low until August. Flash flood watches were issued for August 3 and 10. July was abnormally hot and dry with few thunderstorms. Only four July days had any real flood potential, of which three received some street flooding rains. The late arrival of the Arizona monsoon (July 18) was identified by HDR has the reason for the odd July weather. Their report also notes that this was the second latest appearance of the monsoon in the past 50 years and that the Colorado monsoon season did not begin until August. In looking back at Colorado’s flood history, the last week in July through the first week in August has been a notoriously deadly flash flood period. Once again, the District was fortunate to make it through another year relatively unscathed. This was the first message day of the year for the F2P2. A localized intense thunderstorm over DIA dropped copious amounts of pea-size hail, clogging inlets and causing street flooding along Pena Blvd. This storm prompted the NWS to issue a flash flood warning. The eastern plains received the more serious weather with softball-size hail reported near Limon. This storm resulted in the District’s worst flooding of 2005, disrupting yet another Friday afternoon rush hour. This happens a lot! This time the heaviest rain fell in Denver and Aurora with storm totals approaching 2.5-inches over parts of lower Cherry Creek, Goldsmith Gulch, Westerly Creek and Toll Gate Creek. The majority of the rain fell within a 30 to 45-minute period. 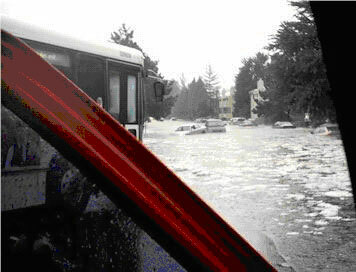 The Littleton area was also impacted by street flooding and large hail. The ALERT system reported 30 rainfall alarms between 4:30 and 6:30 p.m. The Horseshoe Park stream gage on West Toll Gate Creek set a new high water record with a peak flow of 1,900 cfs just after 6 p.m. Goldsmith Gulch overtopped Iliff Avenue in Denver while the side-channel detention basin at that location filled to a depth of 6.1 feet. Residential flooding in Denver’s Hampden Heights East subdivision was the subject of many follow-up news reports. The heaviest rainfall this day missed the District, but hit the ALERT gages in the Jamestown area of Boulder County between 4 and 5 p.m., causing a return of mudslides in the burn area impacted by the 2003 Overland Fire. The storm triggered nine ALERT rainfall alarms from measurements that approached 1.5-inches in less than 30 minutes. From a statewide perspective, the rainfall activity was particularly noteworthy with total amounts exceeding 2-inches in eastern Colorado and more than 3-inches in Kansas and Nebraska. Based on CoCoRaHS data, the State Climate Office estimated that the volume of rainwater that fell on this day would be equivalent to one-third of an inch depth of water over an area of 450,000 square miles. That is one very impressive hydrologic event! A cold front accompanied by weak steering winds prompted the issuance of a flash flood watch on the morning of August 3. Heavy rains arrived that afternoon with rainfall alarms occurring in Brighton and at Red Garden in Eldorado Canyon State Park. The Brighton weather station measured the highest rain total of 1.50 inches. Less heavy rains continued overnight causing concern about possible stream and river flooding. 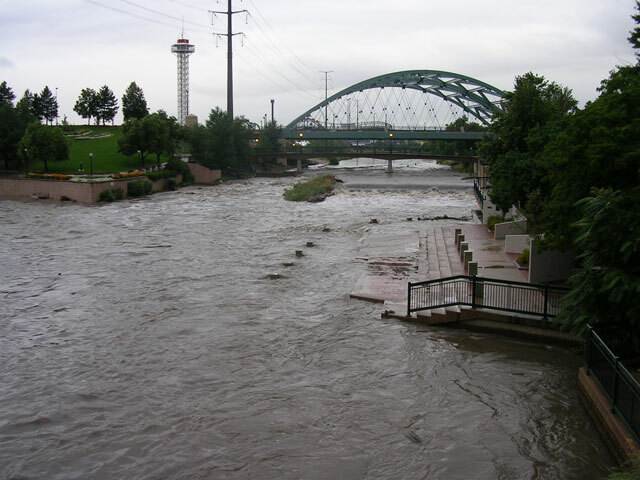 By morning, rainfall amounts were approaching 3-inches at some locations and streams like Cherry Creek and the South Platte River were running high. The events described above represent the most interesting storm days of 2005. Heavy rainfall capable of causing minor flooding was verified by HDR for 17 additional days: June 9, 10, 12, 16, 20, 21, 23, 24; July 15, 24, 25; and August 9, 10, 11, 16, 21, 22. More information about the 2005 flood season and ALERT system operations can be obtained by reading the HDR Engineering and OneRain annual reports. Links to these documents and other useful material can be found on the bulletin board webpage at alert.udfcd.org. Goldsmith Gulch at Eastman Ave.
Sable Ditch at 18th Ave.
Granby Ditch at 6th Ave.
South Platter River at 3rd Ave.